In order for your business to succeed in the local Kelowna market, you need to be more creative in the way to retain and acquire new customers. Gift certificates will help you. 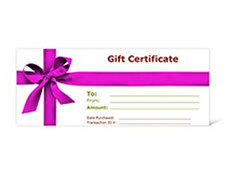 Print Factory offers a high quality gift certificate printing and design services to customers in Kelowna. Give away your company gift certificates to your valued customers in Kelowna to make sure that they see your appreciation of their business. Sell your certificates to your customers in Kelowna, so that they can give them away as presents to their relatives and friends, attracting new customers to you. Give away your gift certificates as a value prize when you do your marketing campaigns in Kelowna. Don’t have the design of your gift certificates yet? No problem. Let our passionate and creative design team put amazing looking design of gift certificates for your Kelowna business. If you still not sure how this product can help your business or have questions about gift certificates, prices, turnaround times and options for Kelowna and area, please don’t hesitate contacting us. We are always happy to assist you over the phone, in person or via email.